God decides to close up shop on Earth--unless two idealistic angels can make a miracle happen. Welcome to Heaven, Inc., the grossly mismanaged corporation in the sky. For as long as anyone can remember, the founder and CEO (known in some circles as "God") has been phoning it in. Lately, he's been spending most of his time on the golf course. And when he does show up at work, it's not to resolve wars or end famines, but to Google himself and read what humans have been blogging about him. When God decides to retire (to pursue his lifelong dream of opening an Asian Fusion restaurant), he also decides to destroy Earth. 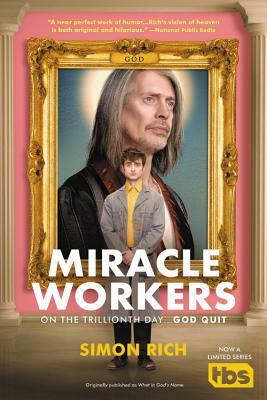 His employees take the news in stride, except for Craig and Eliza, two underpaid angels in the lowly Department of Miracles. Unlike their boss, Craig and Eliza love their jobs - uncapping city fire hydrants on hot days, revealing lost keys in snow banks - and they refuse to accept that earth is going under. The angels manage to strike a deal with their boss. He'll call off his Armageddon, if they can solve their toughest miracle yet: getting the two most socially awkward humans on the planet to fall in love. With doomsday fast approaching, and the humans ignoring every chance for happiness thrown their way, Craig and Eliza must move heaven and earth to rescue them - and the rest of us, too. Simon Rich "is still the freshest, funniest new writer today," according to the Chicago Sun-Times. He has written comedy for the New Yorker, Pixar, Saturday Night Live, the Believer, and various movie studios. He's the author of two collections, Free-Range Chickens and Ant Farm. His first novel, Elliot Allagash, was optioned for a film by Jason Reitman. Rich lives, predictably, in Brooklyn.